The author of the misnamed Epistle to the Hebrews (neither an epistle nor to Hebrews), whoever he was (Origen said that only God knew who wrote it) did not read the Gospel of John. The most probable reason for this was that the “Epistle to the Hebrews” predated the Fourth Gospel. The reading from Hebrews 5 may mystify a Christian shaped by the Johannine Gospel. What does it mean that Christ learned obedience via his sufferings? And what about Christ being perfected? The divine passive in the latter case indicates that God was the actor, the one who perfected Christ. But was not Jesus already perfect–always perfect? The confusion does not cease even when one realizes the particular meaning of perfection in this case–suitability to be the ultimate sacrifice. None of this inconsistency constitutes a difficulty for me, for I am not a fundamentalist. I acknowledge the obvious fact–that the New Testament contains mutually exclusive points of view presented and authoritatively. I prefer the Johannine perspective to that of the author of the “Epistle to the Hebrews” when the two contradict each other. Both readings (Luke 22 and Hebrews 5) agree on the priority of obeying God. The ethic of service (from Luke 22) fits hand-in-glove with the obedience of Jesus (Hebrews 5). 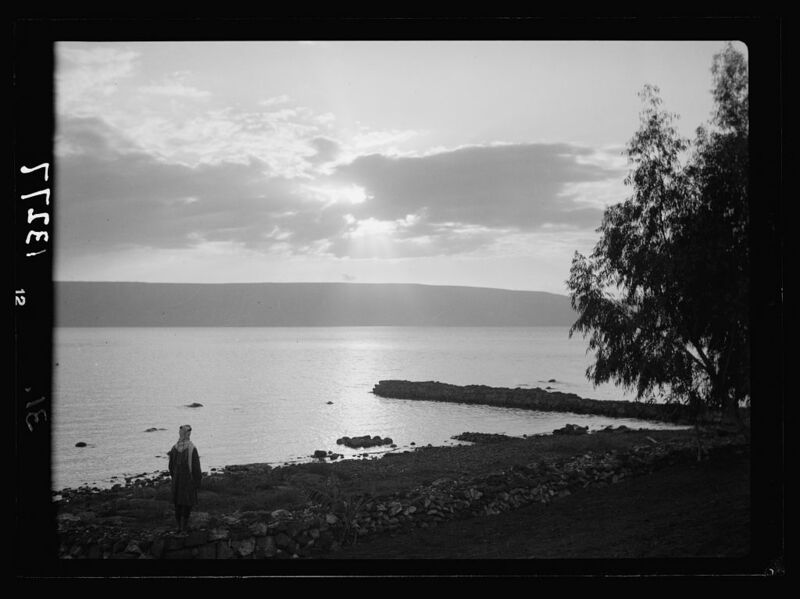 One may also ponder John 12:26 (from the previous post‘s readings), about following Jesus, who loved us all the way to an ignominious execution–his execution, in the Gospel of John. When one considers that statement in the full context of Christ’s life, one realizes that this is no feel-good slogan, but a challenge to discipleship, to cross-bearing. On the morning of December 22, 1991, the Fourth Sunday of Advent, I became an Episcopalian. The Right Reverend Harry Woolston Shipps (who died recently), then the Bishop of Georgia, confirmed me. Officially I retained membership in The United Methodist Church until the following Autumn, on the occasion of the 1992 Charge Conference of the Sumner Charge (four congregations at the time). Indeed, I remained substantially a Methodist for a long time, but I had begun to think of myself as an Episcopalian prior to my confirmation at St. Anne’s Episcopal Church, Tifton, Georgia. I have become convinced that I was supposed to become an Episcopalian, for the affiliation is a natural fit for me. I am, after all, somewhat Roman Catholic while retaining many Protestant influences. Ritual appeals to me strongly also. Furthermore, The Episcopal Church grants me a wide berth to respect certain traditions, break with other traditions, bring my intellect to bear on my spiritual life, disagree peaceably with many people, and be an introvert without feeling out-of-place. Evangelicalism, as I have experienced it, is relentlessly extroverted. That is not an inherently negative characteristic, but the manner in which many extroverts fail to respect the value of introversion and therefore marginalize introverts is unfortunate. Indeed, personality typing helps to explain why certain denominations and styles of prayer are preferable to some people but not others. That which feeds one person starves another. I have never looked back from my choice to become an Episcopalian. As I have become more liberal in some ways, more conservative in others, and incorporated Lutheran theology into my thought, I have become a different type of Episcopalian than I was in 1991. My faith life is a work in progress; I wonder how it will proceed as I continue from day to day. The Episcopalian way of being simply makes sense to me. Since I moved to Athens, Georgia, in August 2005, I have dwelt spiritually primarily at St. Gregory the Great Episcopal Church, Athens, Georgia. I have also frequented two university chaplaincies (Episcopalian and Presbyterian U.S.A.), attended services at First Presbyterian Church and Holy Cross Lutheran Church, engaged in community volunteering at one Presbyterian U.S.A. and two United Methodist congregations, participated in a performance of the first part off Handel’s Messiah at Oconee Presbyterian Church (Watkinsville), and attended community functions at four other churches (Disciples of Christ, Unitarian Universalist, Assemblies of God, and non-denominational Charismatic) in the area. Furthermore, I have attended a diocesan gathering at Emmanuel Episcopal Church, without ever entering a worship space there. The fact that I seldom want to attend services in another denomination demonstrates the fact that I have found my niche. Why should I seek another place? Nevertheless, I am agreeable to ecumenical engagements. My very bones will say, “Lord, who is like you? and he who does not marry does better. St. Paul the Apostle thought that the Second Coming of Jesus might occur within his lifetime, so he argued that changing one’s social or marital status ought not to constitute major priorities. Most important, he contended, was living faithfully to God. Thus avoiding distractions to a proper spiritual life was crucial, he wrote. The Apostle was correct in his case that certain relationships do function as such distractions on some occasions. He also argued correctly that God should come first in our lives. Nevertheless, he was wrong about the timing of the Second Coming and the low priority of working for social justice. A recurring theme in recent devotions in this series has been the sovereignty of God. I have written that to use that eternal truth as cover for hatred and related violence is sinful. Now I expand that statement to argue that using the sovereignty of God as cover for erecting and defending barriers between people and God is also sinful. Yahweh is the universal deity, not a tribal god. Divine power extends to Gentiles, from Balaam (in Numbers 22) to people in New Testament times to populations today. I understand why people erect and defend spiritual barriers to God. Doing so establishes boundaries which comfort and include those who define or defend them. Fortunately, God’s circles are larger than ours. Thus our Lord and Savior ate with notorious sinners, conversed at length with women, and committed many more scandalous deeds. As the Episcopal Diocese of Atlanta tells me, we should draw the circle wider. Drawing the circle wider can threaten an identity founded on a small circle of the pure, but is doing that really such a bad thing? No! We ought to think less about our alleged purity and the supposed impurity of those different from us and focus instead on the vital work of ministry. That work entails both evangelism and social justice efforts, for both aspects are consistent with the Old and New Testaments. If I, for example, have the opportunity to help someone who is hungry eat proper food and choose not to do so, I do not feed Jesus. If I say “be filled” to that person, I do him or her no good. I have not loved my neighbor as myself. And, if I affirm the unjust socio-economic system which keeps many people hungry, I am complicit in a societal evil. The sovereignty of God is far more than a theological abstraction. May it be a great force for loving others as our neighbors in God and therefore for improving society. May grace, working through us, heal divisions, draw circles wider, and engage in radical hospitality. May we witness what the Reverend Doctor Martin Luther King, Jr., called a moral revolution of values in 1967; may we (as a society) value people more than things and wealth. As St. Laurence of Rome understood well long ago, when he gave his life for his faith in 258, the poor are the treasures of the Church. You might have a favorite hymn, O reader. I have one: “I Bind Unto Myself Today,” with original words attributed to St. Patrick (372-466) and the English translation by Cecil Frances Alexander (1818-1895), wife of the Anglican Archbishop of Armagh. I recall growing up in rural United Methodist congregations in southern Georgia, U.S.A. Some of these churches considered gospel songs from the 1920s old. How about a text which goes back the 400s in its original language? Yes, I have a fine sense of history. “I Bind Unto Myself Today” spans seven verses and four pages in the Episcopal Hymnal (1918) and seven verses and three pages in the Episcopal Hymnal 1982. 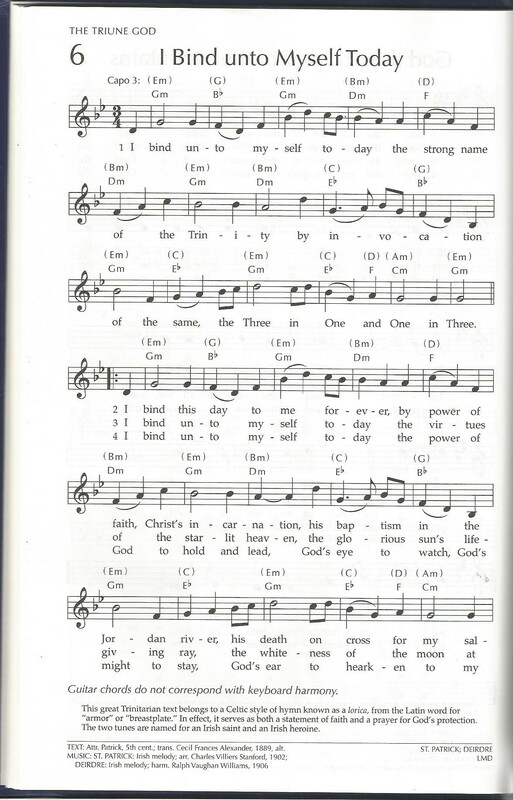 One of the better choices the recent hymnal committee for the Presbyterian Church (U.S.A.) made was to include this hymn (in six verses on three pages) in Glory to God: The Presbyterian Hymnal (2013). 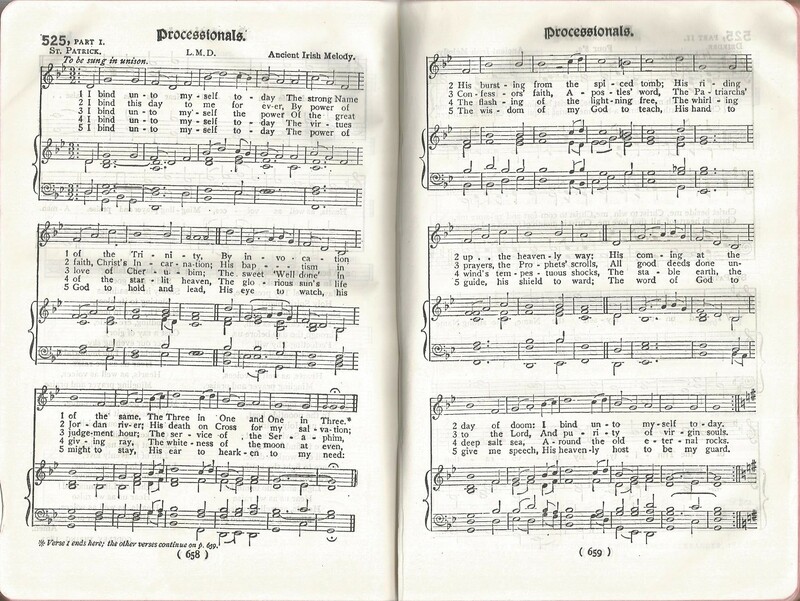 The hymn appeals to my preference for wordy, theologically dense texts, as opposed to spirituals and “seven-eleven” songs with few, frequently repeated words. I could nitpick the text, but why? by invocation of the same, the Three in One and One in Three. Is the hymn not glorious? As I have written on this weblog and elsewhere, I am an unapologetic ritualist. The primary reason for this is simple and straight-forward: Ritualism creates a holy atmosphere removed from the mundane realities of daily life. Within this holy atmosphere I feel closer to God, who is always close to me, I know. But this is about my spiritual life, not the reality of God. And, if anyone chooses to challenge me on my embrace of ritualism, I refuse to waste much time or breath rebutting him or her. I have said what I meant and meant what I said. I have used clear language. If that proves insufficient for someone, so be it. I will not let such a person dissuade me from ritualism. is vital in public worship. Congregations ought not to spend much time impersonating knots on logs. No, they should be very much involved. Most of U.S. Lutheranism has recovered this awareness since the middle 1800s, as my recent self-directed study of U.S. Lutheran liturgy has revealed. 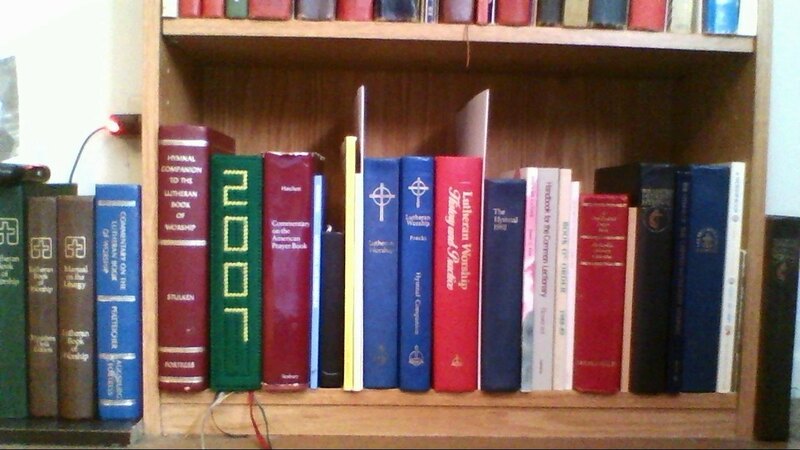 And I, as an Episcopalian, have the wonderful Book of Common Prayer (1979) to use. The best liturgies are ritualistic ones, for they elevate souls and appeal to our higher natures while stimulating our senses. We humans are not merely heads attached to bodies meant only to transport them. And one unfortunate legacy of the Protestant Reformation was a reaction against–not a considered response to–certain excesses and errors of Medieval Roman Catholicism. Regretfully, that reaction continues in bad liturgies designed to appeal to heads, not bodies. Actually, the union of ritualism and active faith is a beautiful combination. My fascination with liturgy originates from within and without. Something about good liturgy appeals to me inherently, so I would have become a ritualist eventually anyhow. And I, growing up in rural southern Georgia United Methodist congregations, witnessed much atrocious liturgical practice. I had to convert or starve spiritually. So I became an Episcopalian. I have never looked back. 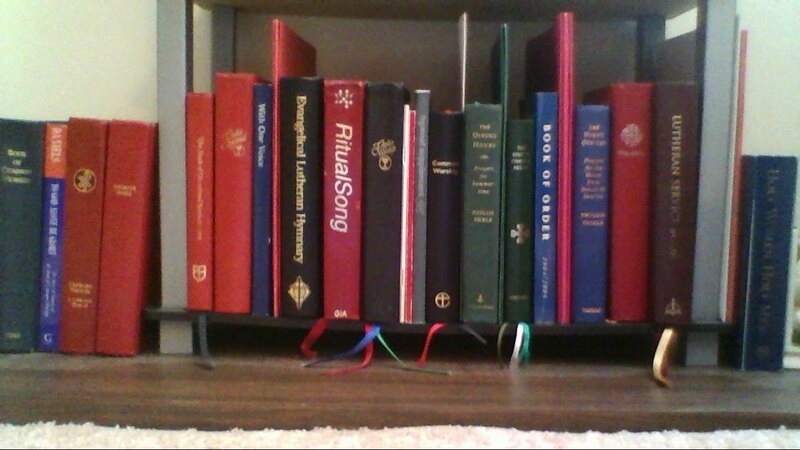 My collection of hymnals, service books, and volumes about liturgy began with a handful of volumes in the late 1980s-early 1990s. Now that collection fills a tall bookcase and spills out of it. Furthermore, I have begun a wish list of books (many of them from the United Church of Canada) to add to my collection in time. My desire to know more about liturgy is insatiable, I rejoice to stay.